Many blade manufacturers have their own design of punches and dies. That's why we specialize in tooling made to your specifications. Send us your details to quote or check out our extensive inventory of punches, dies and shear blades for all makes and models of ironworkers, plate duplicators and angle lines. Punches should wear out. If they break, something happened in the set-up, or something moved or came loose. Send us your used-up or broken punches for evaluation. 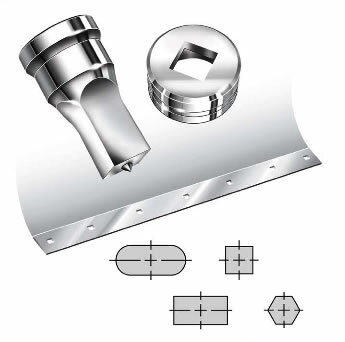 Depending on the failure, we can recommend a possible solution to help increase tool life. Contact us today by phone (800.243.1492) or email to learn how you can benefit from our punches and dies.